I couldn't stop smiling while painting these birds. Maybe it's their graceful, sinuous necks and long legs. They remind me of ballet dancers in tutus. The American Flamingo, a slim, rose pink wading bird, can be found on the Florida coast, the West Indies, Yucatan and Galapagos Islands. Some of those that are seen in the wild in other areas are escapes from wildlife sanctuaries and they are often less vibrant in color as their color fades in captivity. Flamingos inhabit salt flats and lagoons where they feed on small fish and crustaceans, immersing their heads into the water. When in flight, their long legs trail behind and their necks extend out in front. Their call is a gooselike gabbling. 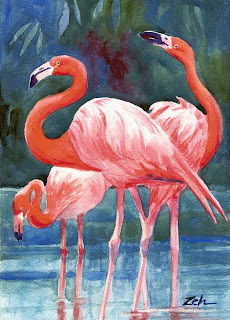 It was a delight to compose a painting of these pretty, sociable creatures. I hope that it brings a smile to your face too.